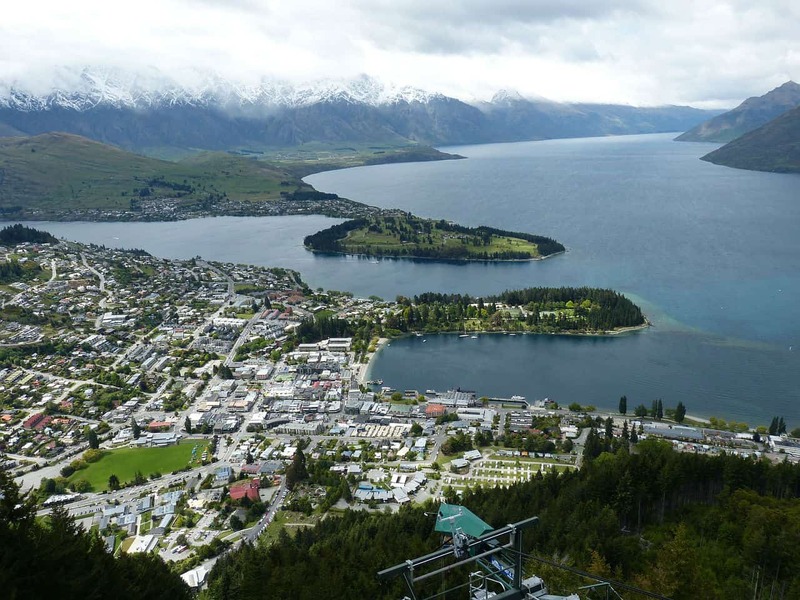 This Queenstown itinerary is a guest post from Scott and Hayley. So you’re headed to Queenstown, New Zealand and you’re ready to stretch your legs and see what the city has to offer. You’ve heard from everyone and their grandmother about how brilliantly beautiful and adrenaline-inducing this South Island city can be, Oh, and how sore your bank account will be after you visit! But you still don’t know about any of the things to do in Queenstown (besides blowing all your cash). No worries! 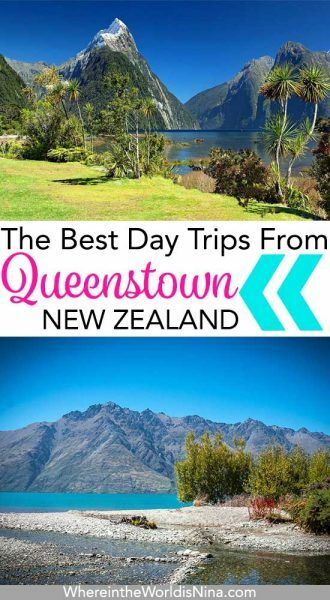 We’ve put together a fab Queenstown itinerary for you including all of our favorite things to do and all the best day trips from Queenstown. Queenstown is known to be the adventure capital of New Zealand, and actually, the world! However, in case you’ve been living under a rock, New Zealand’s beauty is the true draw. 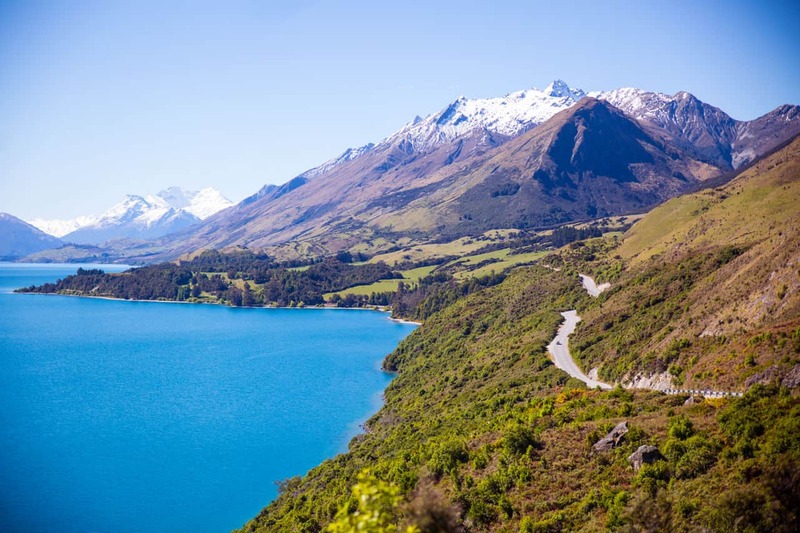 Considering all the things to do in Queenstown involve a level of adventure, they will all certainly be mind-blowingly beautiful as well (so if you chicken out, at least you got a good view, right?). The CBD (“downtown” if you’re American) is a quaint, bustling hub of energy and a perfect intro to all the things to do in Queenstown. On any given day you’ll see hoards of folks lined up outside Ferg Burger, touring the waterfront, and enjoying ice cream. Parking can be tricky, but there are paid parking options around. On foot, you can enjoy the Queenstown Market if it happens to be Saturday. Otherwise, just roam around the beach and side streets. Don’t forget to wander down some alleys. Some of the best food is hiding down some of the unassuming lanes without much on the outside either. If you aren’t too pooped out from walking and posing for pictures, swing by the Botanic Gardens (right next to the CDB) for a lovely walk. Bring your disc golf discs if you’re into that (or want to try and act like you are). They have some fantastic holes to play. For an any Queenstown itinerary, a day trip to Milford Sound is an absolute must. Cruising through the towering mountains, seeing the powerful waterfalls, and exploring the lush rainforest is enthralling to say the least. You can book your trip using one of the options below and choose from just cruise tickets or a package deal of coach ride and cruise ride – this depends on if you’ve rented a car or not. Since it takes all of 3-4 hours to get to Milford Sound (plus the 2-hour cruise), this trip is pretty much an all-day thing. Pack your own lunch to save a few bucks if your tour doesn’t provide one. 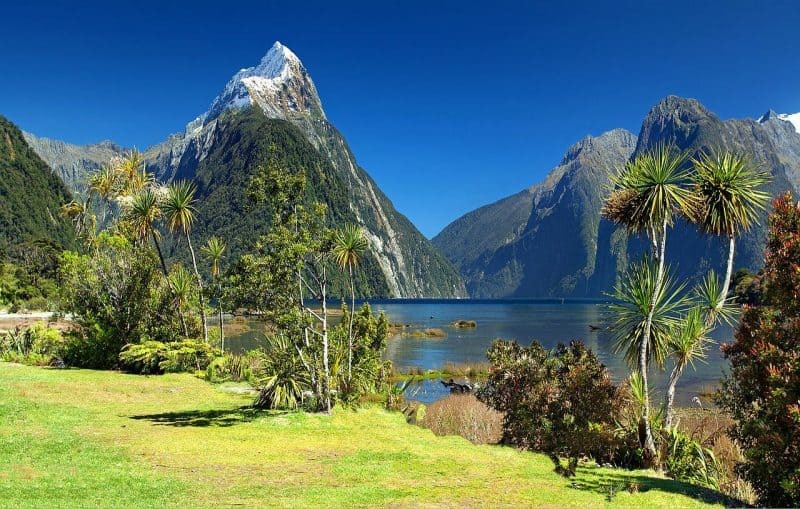 Milford Sound is one of the best things to do in Queenstown. 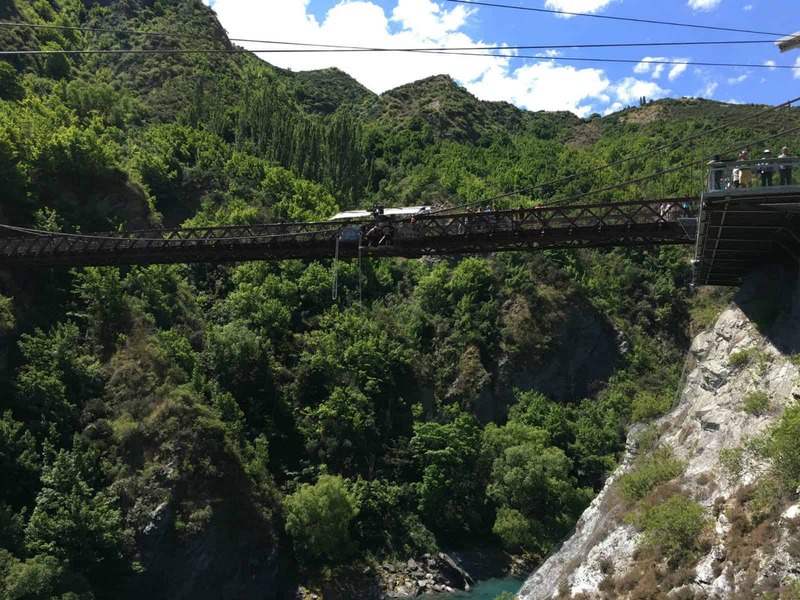 If you want to go bungy jumping at the place that created the phenomena, it’s just a 10-minute drive outside of Queenstown. If hurling yourself off of a safe platform from ridiculous heights isn’t your thing, you can take a Shotover Jet through the local rivers, skydive, zip line, or para-sail. The choices are vast! You’re only limited by your budget. One of the best things to do in Queenstown. Want More Adventurous Things To Do in Queenstown? Of course, you do, but it will come at a price! After all, it is Queenstown though, so what are you here for? If adventure is the name of your game, Queenstown has you covered in every way possible. Here are some of the most incredible, thrilling, and heart-pumping day trips from Queenstown. 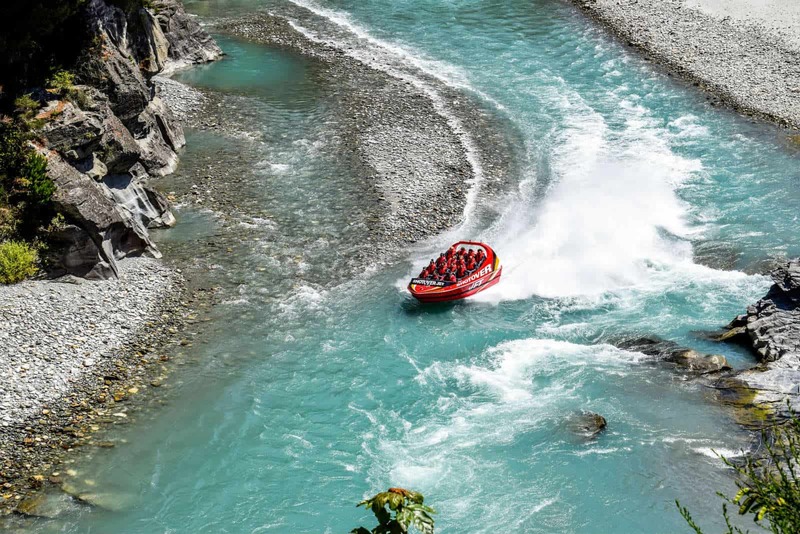 Shotover Jet – Because who doesn’t want to scream for their life while getting smashed with water and whipped around? Ziplining – With the crazy views you get from down below, can you imagine what they are while you’re pretending to be a bird?! 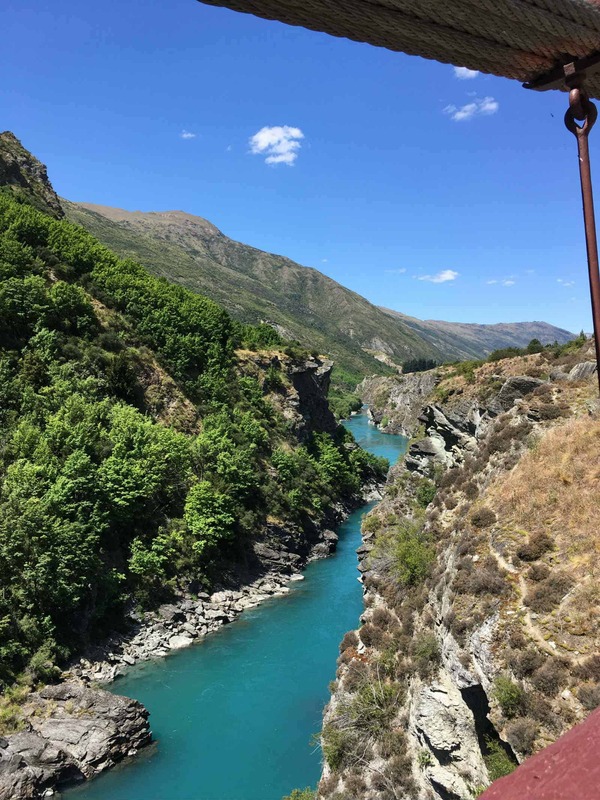 Bungy Jumping – It’s kind of the thing to do in Queenstown. Helicopter Glacier Landing – Ridiculously amazing views but with a seatbelt and no need to jump off anything! Chase the beautiful Southern Lights. Wine Tour – Because wine is life and actually, New Zealand makes great Chardonnay and Sav Blancs. Not exactly an adventurous activity but perhaps after you fly through the air or plummet off of a bridge a nice glass of vino will do you well! Hiking – There’s an incredible amount of hiking all around South Island. Make sure to book activities like these in advance so you can be sure you don’t miss out or mix up a day on your 5 days in Queenstown. Whether it’s winter or summer in Queenstown, there’s something to do! Thrilled with the ultimate Jet Boating experience with Shotover Jet during your 5 days in Queenstown. This is where your Queenstown itinerary has a bit of flexibility. Queenstown (New Zealand, for that matter) doesn’t have a ton of fine sandy beaches. For those, you generally want to look over the pond at Australia. But there is a nice beach just 45 minutes from Queenstown, in Wanaka. 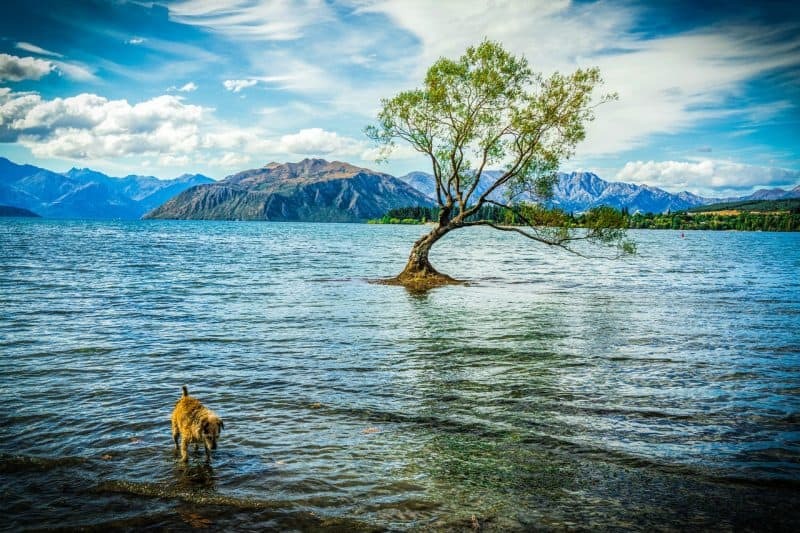 Hop in your car or use a bus to get yourself to Wanaka. If you drive, be aware the roads are windy. 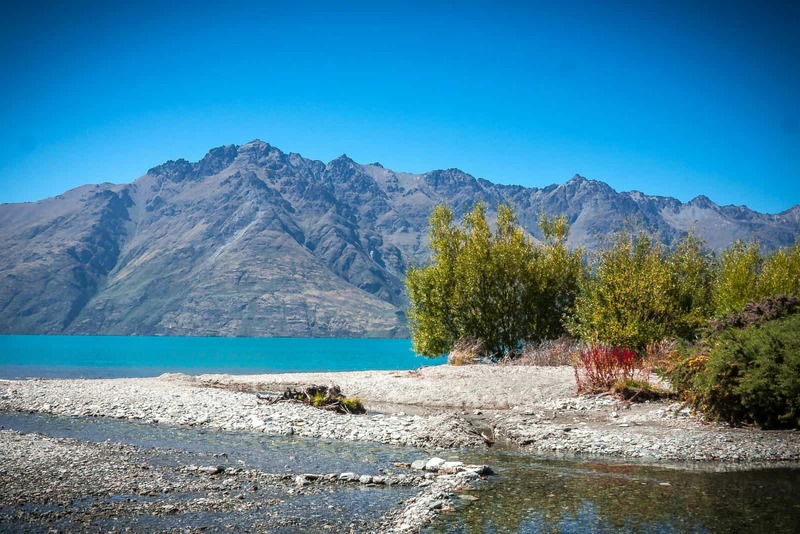 Enjoy year-round outdoor activities like water sports, skiing, and climbing at Lake Wanaka. Once you’re there, head down to the beach for some rest and relaxation. Oh, and views of that crazy tree you’ve probably heard about. Once you’ve worked on your tan and are feeling crispy, take a stroll through the city and enjoy either a meat pie or an ice cream, depending on if you’re a sweet or savory person or both! No judging here. After that, take one final dip in the water before heading home. On the way back to Queenstown, stop by the world’s largest bra fence if you’re into bizarre things like that. If you’ve never been on a glacier before, Fox is a good option. It’s possible to make the drive out, climb the glacier, and return in the same day, but we will warn you, it’s exhausting and the roads are dangerous. 3) have multiple drivers and get going early in the morning. Either way, an ice-hike or heli ride around Fox Glacier is certainly worth it! 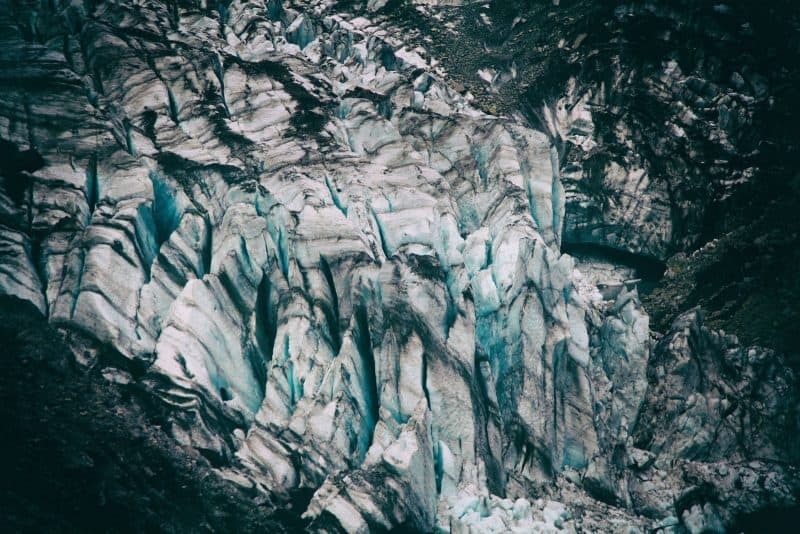 The spectacular scenery of Fox Glacier is a must on your Queenstown itinerary. 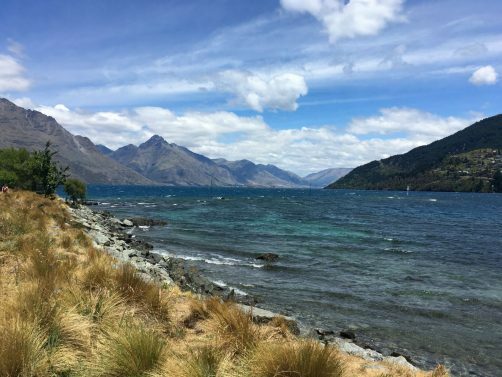 The drive from Queenstown to Glenorchy is scenic (not surprising) and windy (also not surprising), so if you aren’t familiar with driving on the left, please take your time. Bonus points if you brought hiking footwear! It’s hard to even describe the beauty of Glenorchy. The mountains are so picturesque and the water is the bluest of blues! This will certainly be one of the more scenic highlights out of all the things to do in Queenstown. Glenorchy—A must visit during your Queenstown itinerary. The iconic beauty of Glenorchy! If sports aren’t your thing, you can peruse around the waterfront and snap some pictures, or if you’ve brought equipment, you can go windsurfing. If hiking is more your thing, pick a trail and get going. A lot of movies are filmed in this area, due to it’s views, so you might stumble across a live filming set. If you aren’t into adventure and are done soaking up the views, you can check out the shops in the small downtown area and relax in the park. Because it’s just the two of us, we decided to get an Airbnb just outside of town. Prices here were a little cheaper per night and we had free reign of a kitchen to cook our own meals. If it’s your first time getting an Airbnb, sign up here and get a discount! Apart from Airbnb, you can also choose to stay at the following beautiful hotels of Queenstown. Nomads Queenstown Backpackers offers 5-star facilities with free Wi-Fi. This hotel is centrally located and one can enjoy the vibrant nightlife of the city. You will enjoy clean rooms, a central location and cheerful staff. Manor Park Lodge is situated in the heart of the city. It offers various amenities like free Wi-Fi, a terrace, ski lockers, valet parking, and laundry service. One can also enjoy the variety of cafés and restaurants nearby. Queenstown Lakeview Holiday Park is a quaint and friendly hotel. This hotel provides facilities like free Wi-Fi and bicycle rentals. It’s also a great option if you need to be close to the airport. Should I Rent A Car in Queenstown? If you want to take the best day trips and see the most things in Queenstown, you’ll probably want to rent a car. We did and we didn’t regret a minute of it. You can buy tour tickets to attractions like Milford Sound, but it doesn’t give you the flexibility to change plans when needed. Plus, you’re going to need transportation if you want to go do things around Queenstown like jetboat rides and bungy jumping. There are some great deals on rental cars here and here. Take an adventurous road trip around Queenstown. 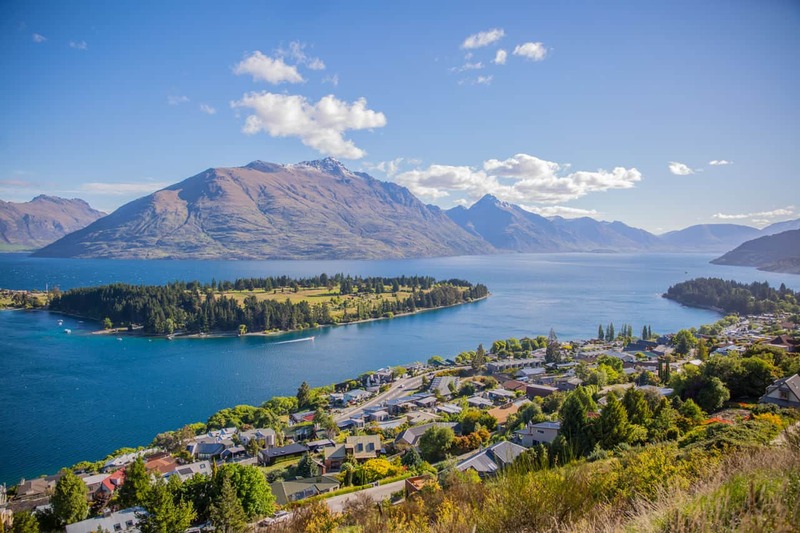 Follow this Queenstown itinerary and you’ll have a great time. Queenstown is an amazing place, and all the potential fun means you’re only limited by the time you have and the size of your budget. So while this Queenstown itinerary is for 5 days, you could really spend a lot longer here—in fact, many people do. Regardless of how long you choose to stay, make sure you’ve packed your camera and get ready to have an adventure of a lifetime. 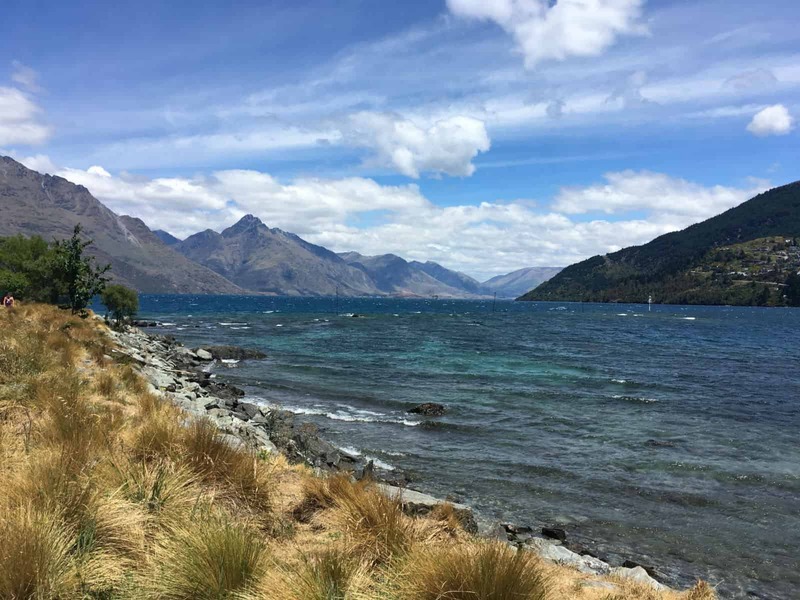 We absolutely loved our stay in Queenstown and we hope this Queenstown itinerary was sweet as (which is kiwi for awesome, bro)! 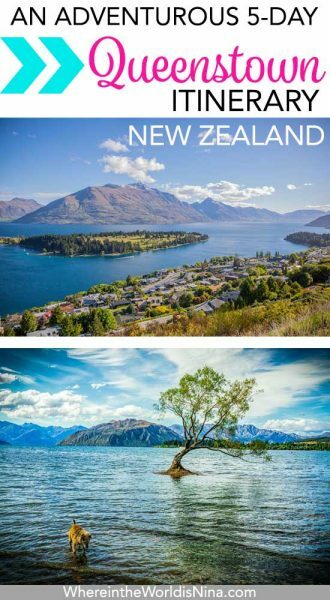 Who is off to Queenstown, New Zealand soon? Let us know your plans in the comments! Scott and Hayley are two Minnesotans traveling full time. They work online and specialize in social media marketing, WordPress development, and blogging. 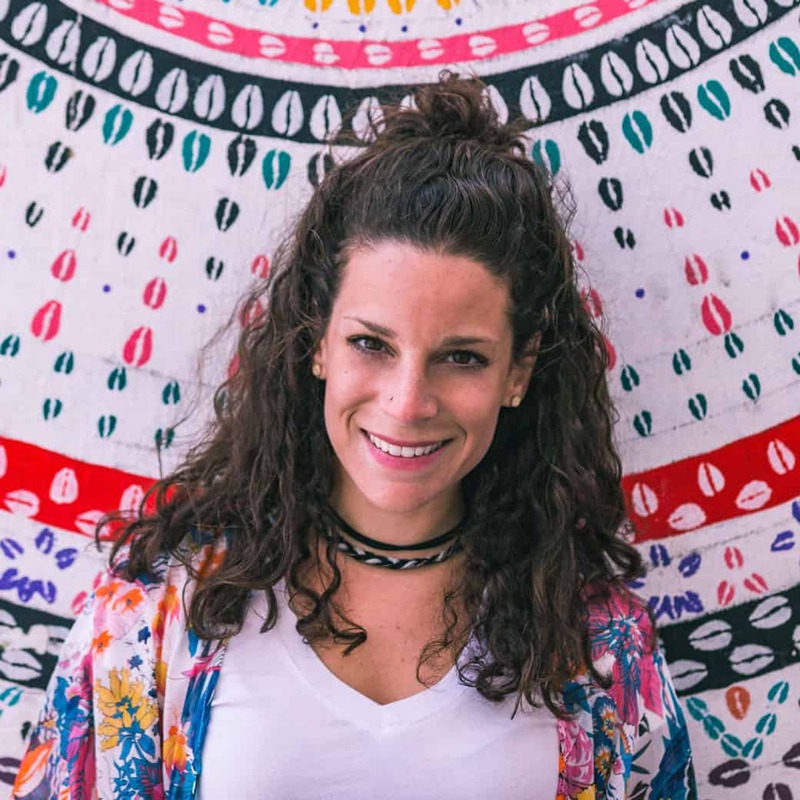 Their main focus is frugal travel and enjoying the simple life. You can check their blog here. Don’t lose this! Click the picture to pin this for later!